Four Sided Fantasy is being developed by Ludo Land, headed by designer Logan Fieth, who previously developed The Fourth Wall, a puzzle platformer that played with the idea of wrapping around the edges of the screen. Four Sided Fantasy is a continuation of that vision, allowing Logan and the team to experiment with a wider range of puzzle solutions in a larger, more fleshed out world. 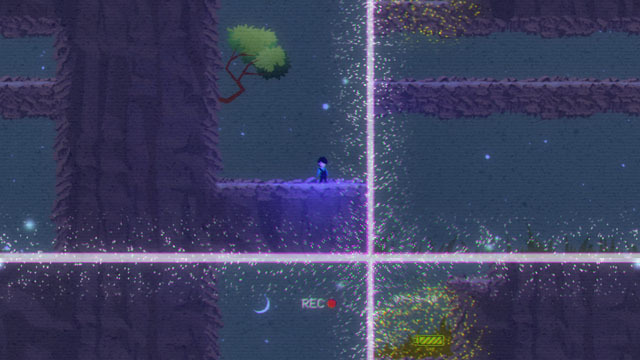 As the player moves through the game world, the screen scrolls along with him, but the player is able to stop this scrolling at any time and make the edges of the screen wrap around. So, moving off the right side of the screen will return you to the left, and falling off the bottom of the screen will make you fall down from the ceiling. This mechanic, used in combination with a number of other mind-bending abilities, is used to overcome various platforming challenges. Four Sided Fantasy is now available on PC and Mac via Steam, Humble Store, and Itch.io, and PS4 via PSN. Check our coverage here.